The electrical technician program is specifically designed to meet the needs of companies requiring individuals with skills in residential, commercial and industrial electrical wiring. In addition, the student will attain knowledge of the communication field and burglar/fire alarm systems. As the population creates more demand for electrical service the need for well trained electrical technicians continues to increase. Throughout the program students will receive a combination of theory and practical “hands on” training. Many students find a career as a cable installer, motor repair service technician or a maintenance electrician for manufactures and large commercial buildings. Connecticut graduates of IMTI often complete the program to pursue self employment as an Electrical Contractor. The following companies hired IMTI graduates: Ariel Electric, C & D Electrical, Calo Electrical Service, Camsan Electrical Contractors, Commet Communications, Delmar Electric, Electrical Contractors, Inc., HB Communications, Mars Electric, MJM Electric, Sarracco Mechanical, Sunlight Solar Energy, Traver, IDC, Tri City Electric, VEECO Electric. 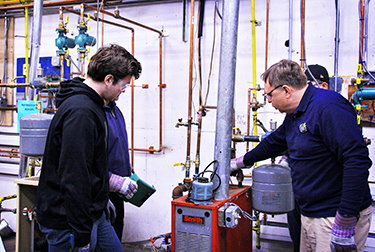 The HVAC Technician program is structured to provide the technician with the skills, knowledge and techniques necessary for employment as an apprentice in the refrigeration, heating and air conditioning service industries. IMTI comprehensive program of theory combined with extensive “hands on” training impress upon the student the importance of accepting individual responsibility for the proper diagnosis and repair of various units. Focus on low voltage electrical and electronic systems gives our students the knowledge they need to wire low voltage HVAC systems. 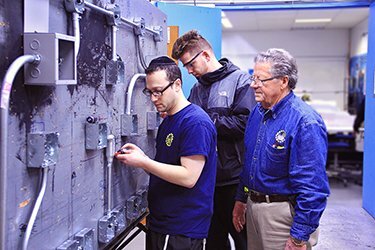 IMTI of Connecticut graduates will have learned the technical skills for an entry level apprenticeship position as a general service person installing or servicing heating, air conditioning, and refrigeration systems. The following companies hired IMTI graduates: A.E. Olson Heating and Cooling, Carmins Plumbing Heating & AC, Connecticut Restaurant Service, Custom Air System, H B Communication, Lego Corp, M J Fahi and Son, Mitchell Oil Company, Sarracco Mechanical, Sav Mor Cooling & Heating, Siemens, Sippin Energy (In Field), Steve Basso Plumbing & Heating. The Plumbing Technician Program is designed to give the technician the skills to install, fit, repair, and maintain residential, commercial, and industrial plumbing. The student is taught to properly finish a job while maintaining the highest sanitary standards possible. Throughout the program students will receive a combination of theory and practical “hand on” training. There are three distinct plumbing systems that work together to achieve the desired result in a sanitary and safe manner. The fixtures – lavatories, bathtubs, toilets, drinking fountains, washing machines, etc. The drain – water leaving the system usually by means of gravity. Graduates of the Plumbing Technician program will have learned the necessary skills for an entry level apprenticeship position in residential, commercial, and industrial plumbing applications. Many IMTI graduates complete the program to pursue self-employment as a plumbing contractor. The following companies hired IMTI graduates: All American Plumbing & Heating, Allen's Plumbing Supply, Benjamin Franklin Plumbing & Heating, Crest Mechanical, Emond Plumbing & Heating, Hart Mechanical, M . J. Fahy & Sons, Malangone Plumbing & Heating, MD Mechanical, Plumbing Work LLC, Ray Flanagan Inc, Roto-Rooter, Solvit, Total Plumbing & Heating, Wesleyan University (In Field). We are always excited to pursue an IMTI graduate for job openings. The several we have hired are knowledgeable, serious about their trade, and “job ready”. I would strongly recommend that you consider IMTI graduates as future candidates for employment. We would definitely encourage anyone looking to go to school to pursue a trade to take a good hard look at IMTI for their studies. The students get a great “hands on” approach to the information and come out well prepared to go directly into the field. IMTI’s placement rate is extremely high and that is a testament to the quality of the school and everyone involved in it.